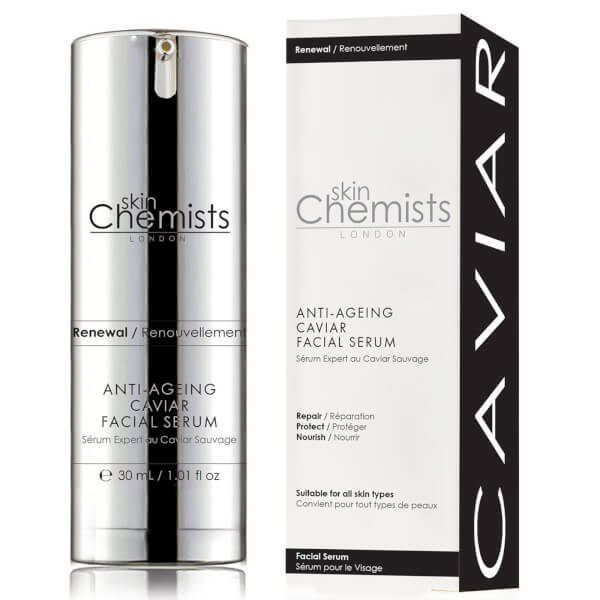 Smoothen and replenish your skin with skinChemists London Anti-Ageing Caviar Facial Serum, a rejuvenating formula that hydrates and soothes to promote a younger-looking complexion. 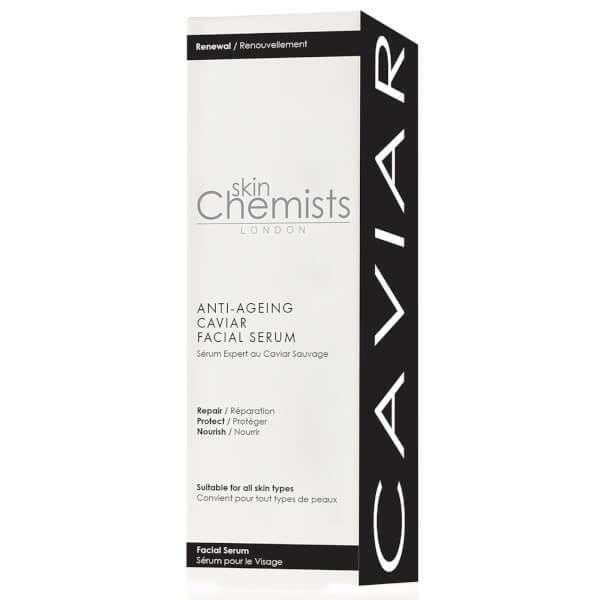 Infused with vitamin and mineral-rich Caviar, this nutritious marine extract effectively moisturises while improving firmness and reducing the appearance of fine lines. 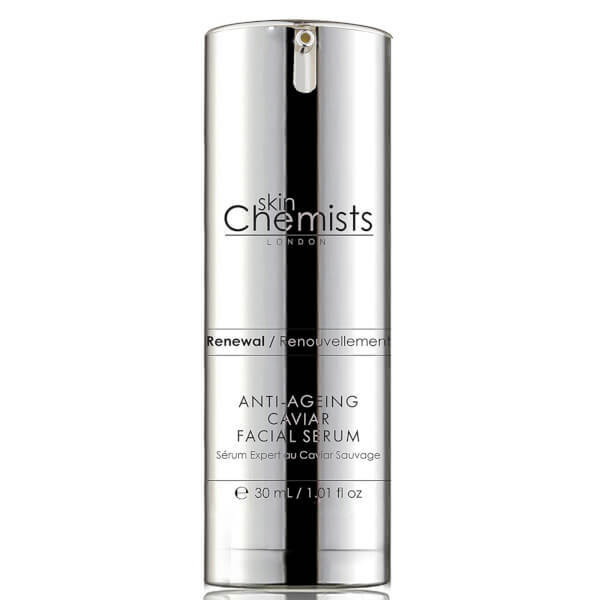 The nourishing serum melts into skin, plumping it with moisture to help diminish the look of wrinkles, while a host of antioxidants protect against external aggressors. 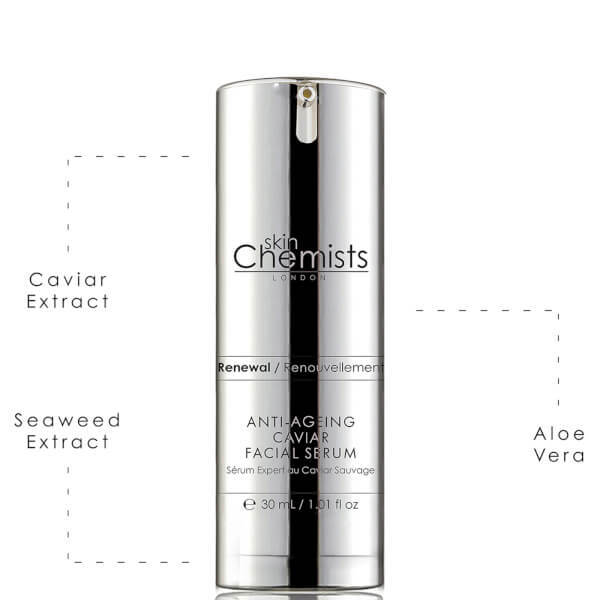 Aloe Vera soothes and moisturises, and Seaweed extract hydrates and protects. 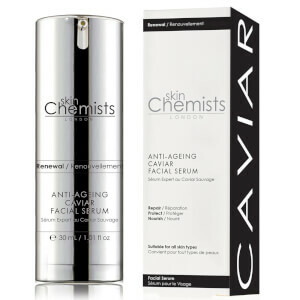 After use, the overall complexion appears balanced and improved; lines look smoother and moisture is retained. Smooth a pea sized amount in gentle circular motions onto the skin every morning and evening after cleansing, toning and exfoliating. Aqua (Water), Triethanolamine, Carbomer, Alcohol, Allantoin, PEG-7 Glyceryl Cocoate, Phenoxyethanol, Disodium EDTA, Dehydroacetic Acid, Ethylhexylglycerin, Parfum (Fragrance), Benzyl Salicylate, Hydrolyzed Actin, Caprylyl Glycol, Hexyl Cinnamal, Aloe Barbadensis Leaf Extract, Hydrolyzed Caviar Extract, Hydrolyzed Roe, Limonene, Acetyl Hexapeptide-8, Fucus Vesiculosus (Bladderwrack) Extract, Propylene Glycol.